Sophisticated elegance, chandelier drop diamond earrings crafted in 18K white gold with rose and brilliant cut diamonds, one hundred and four diamonds with a total combined weight of 5.48 carats. All center diamonds are GIA or AGS certified. All diamonds are source in strict adherence with the code of eithics set by the Canadian Jewellers Association. 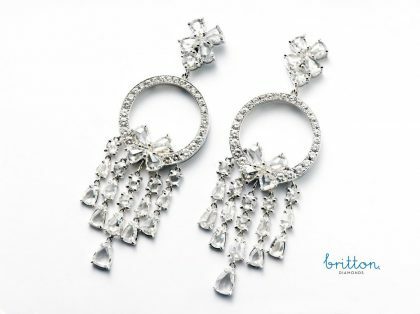 SKU: 140-00134 Categories: Diamond Earrings, Earrings.